Businessman and MP Tiran Alles was barred from leaving the country by the Fort Magistrate’s Court today with regard a financial misappropriation case against him where a company chaired by him and established to reconstruct houses for Tsunami affected families has been charged with misappropriating state funds. 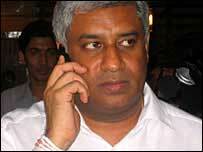 Five others suspected of being involved in the corruption apart from Alles were also barred from leaving Sri Lanka. According to the Police, the RADA Company has been established under the Chairmanship of Alles who is also the proprietor of Maubima newspaper, to engage in the construction of houses for Tsunami affected individuals in the East Coast. The company had obtained a total of Rs. 645 million from the Treasury with the approval of the Presidential Secretariat for this purpose but no houses had been constructed so far. Meanwhile the Police confirmed that the funds collected by the company were credited to Oomps textiles Ltd. – another fake company formed by three individuals identified as Shanthi Kumar, Gajan Kumar and their mother Anandi Shanthi Kumar. The Court had been informed today that through this company and two other bogus companies, a total of Rs. 125 million has been misappropriated by the Company. It was also mentioned that the State funds paid to Oomps Textiles Ltd. had been taken over by Alles and former LTTE-er Emil Kanthan. Meanwhile addressing the media today, Alles rejected the allegations leveled against him of misappropriating state funds reserved for the benefit of Tsunami victims using fake companies and said he is a victim of a ‘targeting’ campaign launched by the current government. He also said however that he posses controversial information regarding those who bear a vested interest in ‘targeting’ him in this manner and that he would expose them in the near future. including surreptitious deals even with Prabhakaran and the LTTE – as the fairly informed are aware. His long time connections with the LTTE racketeer Emil Kanthan should be thoroughly investigated. He was brought into politics, by and large, by Mangala S. The latter was the first whom Alles betrayed. It is also known he faked a bomb attack on his Nawala home merely to gather sympathy and cheap publicity. What low quality men this country is fated to endure in our public life. Can we have his balls? We want to play cricket. Better than “Kaduru Bola”, that keeps splitting. Rajapaksa gave some money back to Tiran Alles. Tiran Alles bought balls, VP balls. He played cricket with VP balls. Now the people needs to play with Tiran Alles’s balls. Dont worry Alles!.They wont go beyond impounding passports. Dont worry Alles! They wont go beyond impounding passports. The media should pressurize Tiran Alles to reveal whatever he has got. If he refuses then the chances are that he is a criminal and I won’t be surprise if he disappears to South India soon in a fishing boat. Tiran is an opportunist. He had no chance of entering the Parliament had he not taken the Field Marshal for a ride in the guise of fighting for his exoneration from all wild allegations against him. Though I am not Ranil’s admirer, the very reason he carried a vicious campaign against him is due to personal vendetta. He is [Edited out] crook and brought before the law. Including yahapalana big wigs? Or just only MR loyalists Mr/Ms/Dr Snowden? Very Strange. Gotabaya did not ask Who is Tiran Alles? Tiran Alles was the man responsible for the defeat of Ranil W. at the Presidential Poll of 2005.He carried the Bribe of MaRa to the LTTE! R.I.T.Alles father of Tiran was essentially an Isscola Mahataya.How did these folks end up on centre stage? I do tend to believe Backlash when he says that the attack on his house during the Presidential Poll of 2010 was fake! Tiran is capable of anything;Same as Sajin Vass Gunawardena! In deciding the fate of UNP leadership trying various underground actions including the use of Tissa Attanayake to mislead the voters. Time has now come to face the trials for misdeeds committed. All of these crooks can now get themselves admitted to the prison hospital !! Sorry about my warped sense of irony: Do we really have enough qualified Prosecutors in the Attorney General’s office and are there trained, educated Police investigators with Forensic and Financial fraud training? This is how crooks like Alles will escape. Alles is a school drop-out, [Edited out]. No point wasting any time trying to figure out how the Alles-Gateway empire came into being. Suffice to say it roots are corruption riddled. Ranil W fired RIT Alles for insubordination!!! RIT Alles was a capable administrator and educator. No one can take that away from him. He was also a manipulator and corrupt. Tiran Alles has made money at every given opportunity and a review of his loyalties for the last 15 years is graphic proof of his mercenary instincts. He made money even WITH the LTTE!! That has to be a Gold Medal winning track record in its own right. Managala Samaraweera must beon his knees praying that those facts do not come out too soon….. I just cant help but cringe when Tiran .Alles says he will name others who were as involved as him. This shows the caliber of people most Sri Lankans think, are real business tycoons and visionaries!! The truth is all these peoples are fakes,racketeers and wheeler dealers created by the media……and presented as stars .!!!! Alles , together with so many others ,who he says , he will name, must be put behind bars!!! Just add to this list and see what i mean…. You puritanist have conveniently forgotten Ranil who has appointed 4 code relatives tom state controlled offices and who r dares to hang on as leader of the UNP by abolishing constitution of the party; and Ravindran Karunayakam who stands acused in hight courts of money laundering. Youy also conveniently ignores to mention who appointed this daylight robber Mhendran , the LTTE financier’s childhood friend and who is not a citizen of Sri Lanka. You Sam Samare if that is your real name stink to high heavens. Ravi K has been cleared by the courts , if you insult the final court decision , you may be charged for contempt of court ! you also conveniently forget the fact that couple of rouge American citizens who were running the country for last 10 years , where is the minister who was responsible for countrie’s economy today ? is he hiding in Vietnam ? where is the other fake hero who fled the country fear of his dear life during the height of LTTE ? does he still control the forces and the infamous white van brigade ? do you know that he is mentally preparing for his final rightful place ? can he challenge the current executive president by giving one sided silly interviews ? Gigiruwa or what ever you are , please remember we the 6.2 Million people voted out your king Kakille first and now we are prepared to repeat the same thing on all his lackeys (MPs) at the upcoming General Election , upon completion of the election we the peace loving people want to see all the mafia family members behind bars for the rest of their life ! PS: that BBS thug Gnanapala also going to accommodate your fake hero in Walikada. how is that for a start ? Ok great! Yahapalanaya has got Tiran prosecuted! What next? Yahapalanaya has got the the small (red) herring! The tsunami sharks are still lurking around mara and the oiler, Lalith Weeratunga! Why have you not got them? There are plenty of other Tsunami horas too!